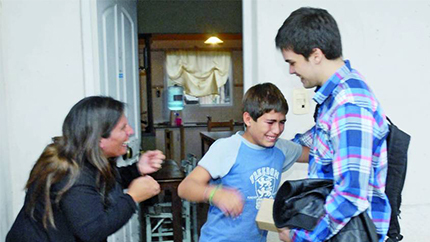 Helping people in need comes naturally to Gino Tubaro, an electronic engineering student and National Youth Science Camp alumnus from Buenos Aires, Argentina. Gino and his team at Darwin Research use 3D printers to create low-cost prosthetics, which would otherwise be very expensive and difficult to import. One of their first designs was for an 11-year-old boy who was born without a left hand. Gino’s team worked with 3D printer templates from Thingverse to create the prosthetic hand. Clarin, an Argentine newspaper, sponsored Gino and his partners’ trip to personally deliver the prosthetic hand more than 285 miles (460 km) from the capital. Between hugs and tears of joy, Gino gave the young boy his new prosthetic hand. After the successful visit, Darwin Research and 3D Lab Fab & Café, a café that allows guests to use 3D printers, posted an interest form on their websites for people in need of 3D printed prosthetics. Within only a 24-hour period, they received more than 100 applications.